I know in a previous post that many people thought I was railing against Facebook. I should have been more clear by stating that I was against closed Masonic message boards. What is frightening is the lack of open communication. Nothing leaves the password protected message board. With all that being said, I want to tell you just how pleased I am to see lodges, grand lodges, and other Masonic bodies making a name for themselves on Facebook by creating a Facebook fan page. Masonry is a brand and we should seek to use that brand to make the general public more aware of who we are. Each lodge and each grand lodge has a need to reach out to brothers and interested worthy men on the internet. My own lodge has a wonderful website but we also supplement this site with a Facebook Fan page and a Twitter page. That way, we can maximize our reach on the internet. These ways of reaching brothers and interested men is paying off dividends with the number of petitions and seats filled in our lodge room. Also, as the High Priest of Corinthian Chapter No. 33 (also in Farmington), I have created a Facebook fan page for both Chapter and Council. Again, brothers are starting to take notice of the appendent bodies in Farmington and we are starting to get petitions to join and affiliate in both bodies. Thankfully, the Grand Lodge of Minnesota, A.F. & A.M. has created their own Facebook fan page. This Facebook Fan page is wonderful and can really help lodges plan their events. It appears that the fan page takes those events from the Grand Lodge's website and posts them. Now, any brother that is on Facebook can RSVP on these events and can really aid those lodges that are hosting the event in numbers and getting the word out to two different calendars, which again, maximizes the event's exposure. I think this is wonderful; Masonic organizations are seeing the potential of the internet and using its power. This is a great and long overdue. Let's hope that more Masonic groups take the leap, especially when that step costs nothing. I can't wait to see how Masonry continues to evolve. So I have returned to blogging about Masonry and I have found that there are very few of us left. As I mentioned in my last post, I think the problem is the many walled gardens that have been erected throughout the internet closing the avenues for Masonic ideas. That means it's my job to get you guys back out of the woodwork again. I know you're out there. I would like to encourage more brothers to blog even if it's about their experience becoming a Mason. Ask yourself, why did I join?, what do I want out of Masonry?, or any other question you can think of and start a journal of your Masonic experience. All of us want to get something out of our time which is why we joined this Fraternity. We want a place to learn and present ideas. Some of those ideas should be behind closed doors but some ideas should be allowed to flourish, to create a set of best practices. Frankly, if we are are presenting a Masonic idea that should be behind a closed door, then that door should be both physical and tiled not merely behind a computer password. My hope is that, in the coming months, I will present a full list of my experiments as Master and how they have changed Corinthian Lodge. If you are a Masonic blogger, post a comment below with the name and address of your blog so that everyone can find and read your material. Bro. Matt has again been so kind as to write another brilliant piece. He has recently been installed as the Lodge Education Officer for Braden Lodge No. 168 in Saint Paul. If you want a wonderful Masonic experience, visit Braden Lodge. You can visit their website or their newly established blog. Braden Lodge meets in the historic Triune Masonic Temple at 1898 Iglehart Ave, Saint Paul, MN on the 1st and 3rd Thursday of each month. I sat just left of the big chair in the East. I wore my most professorial outfit I could put together: a suit jacket over a dress shirt over a black tee, no tie, buttoned down, with blue jeans and sneakers. The look was more Greg House, M.D. than Noam Chomsky, but it served. I finished it off with a scarf around my neck and a pipe in my hand, which Worshipful Master Jesse Williams insisted I should hold tight-lipped in my mouth so I could nod professorially at all the profound thing’s he’d no doubt say. I was an academic now. A learned man sitting in the revered seat of Lodge Education Officer, and holding the sacred trust of educating both young and old brethren in all things Masonic. Here I am, not even possessing my one-year pin (which I’m fairly sure they don’t make), and I’ve been installed as L.E.O. of Braden Lodge. I knew it was coming, but when Jesse officially requested me to take the job I was suddenly nervous. What do I know about Freemasonry? I even asked a brother, someone who would make a fantastic L.E.O., if he was interested in the job at all. No, he said. That’s something that he wouldn’t be ready to do for maybe another ten years. He didn’t know nearly enough about Masonry. I had to admit I may have made a misstep. But then I have to remind myself that it’s not really a professorial role, is it? It’s not me lecturing the brothers every two weeks on exactly what Freemasonry is, and how it should be interpreted, and to detail its nooks and crannies like a particularly wizened English muffin. This is all up for interpretation. It’s all up for debate. This isn’t the office of Orator. I’m not a pontificator. It’s my job to educate not by telling people what to think, but by making sure they have the resources needed to think for themselves. To me an L.E.O. isn’t so much the possessor of knowledge, but the gatekeeper of access to light. The L.E.O.’s emblem isn’t an open book, but a lantern, used to direct people to the knowledge they must seek out to complete their own journey. Yeah, I’m a bit of a poser, acting out a part and sitting in a chair much to big for me to fill, but some clarity came to me that very night when the Worshipful Master, set to give a 45-minute reading of Dr. Martin Luther King Jr.’s Letter From Birmingham Jail, leaned over and spoke to me. “Sit in my chair, and hold this,” Jesse said, handing me his top hat; one worn by worshipful masters throughout Braden’s history. “And put it on,” he added. And all of the sudden I was sitting in the east. And the hat even fit. And I sat upstraighter, and with more dignity. I hadn’t done anything to deserve the role, and to besure it was merely a ceremonial technicality, but for 45 minutes, I was master of Braden Lodge. All chairs made for men greater, wiser, or more experienced than us are too big to fill. They were too big to fill even by these great, wise, experienced men before us. But no matter our qualifications, we fill the seats we’re given, because something in that seat of obligation fills us in return. And we grow bigger. As I reported a few months ago, I began my Capitular journey with the Mark Master degree. A Royal Arch Chapter is a great place to extend the tactile learning we as Masons crave. You are a candidate, and you take a physical part in the ceremonies. There may only be four degrees but those four degrees contain some of the greatest lessons a Mason can learn. The Royal Arch degree has been called the most beautiful degree and I am apt to agree. Now that I've completed my term in the East as Master of Corinthian Lodge No. 67, I've been elected and installed as High Priest of Corinthian Chapter No. 33 which also meets in Farmington. The analog of High Priest in the blue lodge is the Worshipful Master. I'm hoping to ride the train of trying new ideas into my work in Chapter. I will present different ideas on this site for comment and criticism. One of my first goals is to get the two bodies of the York Rite that meet in Farmington, Corinthian Chapter No. 33, R.A.M. and Northfield Council No. 12, R&SM on the web. I've created a Facebook page that will be used for event planning but also to discuss Royal Arch and Cryptic Council in general and its importance to further light for the Masonic student. Of course, the goal is to one day have a great web presence for York Rite Masonry in the south Metro. We are very close now. What all Royal Arch Masons should explain to new brothers is not that you are a York Rite Mason. I know this seems counter-intuitive but we should focus on our Chapters before the Council or Commandery is discussed with a candidate. The Royal Arch is Act II of the Master Mason degree, should we be so restrictive of our brothers of other faiths as to restrict them from enjoying the completion of their labors? If a Companions seeks more degrees, then he may go forward but we should focus on the Royal Arch first. What I'd really like to do is encourage all Royal Arch Masons to come down to Farmington and work to make Corinthian Chapter what we would like it to be. We have many options. 1.) We could work as a "Teaching Chapter". What I envision is a Chapter dedicated to performing degree work even when we have no candidates for the Royal Arch. Other Chapters would be invited to come down and work on whatever degree they would be performing soon. We would read through their parts, discuss what they need to work on, and help degree work throughout the state. 2.) We could work as a "Learning Chapter". The Companions would bring in a paper or presentation about Chapitular Masonry. This Chapter would resemble an Educational Lodge or Lodge of Research. We would ask for papers around the state and have them presented for the betterment of the assembled companions. 3.) We could work as an "European Concept Chapter". I have wondered a lot about using European Concept with Corinthian Chapter. The European Concept is in the family of revitalizing stylistic changes happening within some Masonic bodies. Another similar concept would be Traditional Observance. Two European Concept Royal Arch Chapter already exist and would serve as the model, Meridian Chapter No. 60 of Oregon and Norwood Chapter No. 18 of Edmonton, Alberta. European Concept requires a lot of dedication from the Companions but when the work is done, great things can be accomplished. Thankfully, Corinthian Chapter is open for any change and it would only require dedication from the Companions. Also, because Corinthian Chapter only meets every other 1st Monday from September to May totaling 5 meetings in all, work would be focused on each degree plus one paper and an installation night. 4.) Of course, we, as a Chapter, could use a combination of these concepts to improve the work of the Chapter. Perhaps a paper or presentation will be made during a meeting while we practice the degree that the paper was describing. Perhaps we could host a Festive board. There are many possibilities. If you are a Companion in Minnesota and live near Farmington, why not pay a visit to Corinthian Chapter? If you want to help to improve Royal Arch Masonry in the South Metro and you are looking for more leadership opportunities in Royal Arch, come on out and affiliate. We have many places and parts that need to be filled and improved. If you're a Master Mason and would like to join the Royal Arch, send an email to highpriest@farmingtonyorkrite.org. We will begin the Mark Master degree on February 7th starting at 7:30 pm. Space is limited to three total candidates, only two spaces remain. The Faribault Daily News has published a story on Faribault Lodge No. 9's officer installation. Worshipful Master Jimmy has been installed as Master for this year and Worshipful Brother David has been installed as LEO. The Most Worshipful Grand Master of Masons in Minnesota, Most Worshipful Brother John Cook, was the installing Master which is a great honor for any Master. 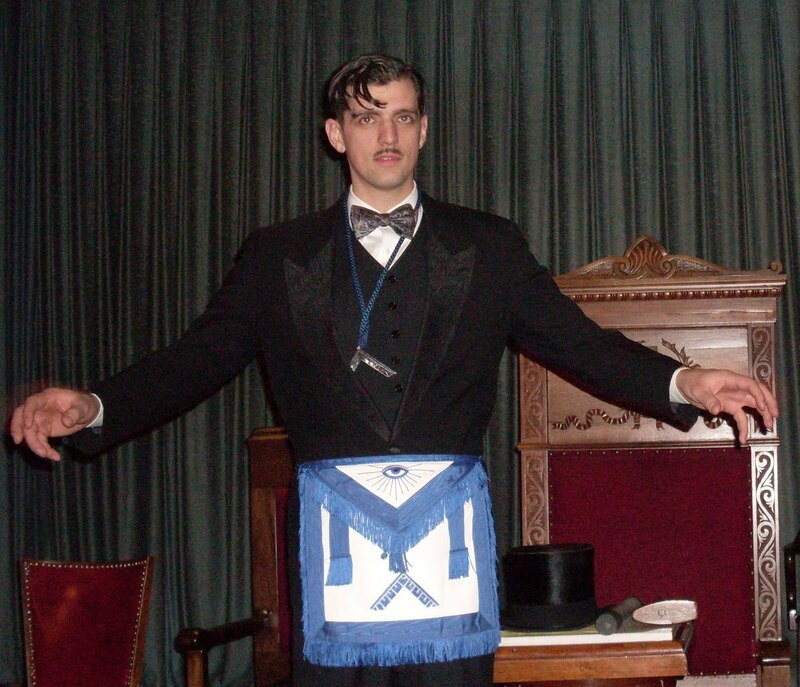 If you have never met Worshipful Master Jimmy, you need to meet him. He is one of the hardest working brothers in the state and his wife and he are extremely involved in Job's Daughters in the state of Minnesota serving on the Grand Guardian Council. If you have never been to Faribault Lodge No. 9, you need to make a trip down there. The brothers are quite gracious and very knowledgeable on Masonic subjects. I remember my last trip there very well as we came to claim the Faribault sword. It was an honor to have sat in the East with Worshipful Brother David at that communication. These brothers are bringing Masonic light back to Faribault. Faribault No. 9 meets the 2nd Monday of each month, except June, July, and August. Brethren, you know the song "Wonderwall" by Oasis? It goes "today was gonna be the day, but they’re gonna throw it back to you. By now, you should have somehow realized what you gotta do..." I'm 27, a Millennial and I've been a Mason for 9 years and a DeMolay for two more on top of that. I was stateside in the Army from 2002 to 2005 where Masonry and its appendants were the only way I "went abroad." I turned majority while serving what was then Alexandria - Washington Chapter, DeMolay International while they were meeting at the George Washington National Masonic Memorial in Alexandria, Va. People who meet there generally think like the memorial is just another temple to them. I, on the other hand, found it to be a pleasure doing business in the premiere house of American Masonry. If there are two things I regard highly in my Masonic career, they'd be... that which is unique... and that which is obscure. I just told you about the unique... now; let me tell you about the obscure. What you probably don't know is that Masonry has a service organization that is registered with the DOD's Morale Welfare and Recreation (MWR) and the VA's Volunteer Service (VAVS) as a service organization in many of their facilities. It has the same classification as the VFW, American Legion, and the USO in said facilities known as the Hospital Visitation Program (HVP), which is a part of the Masonic Service Association (MSA) of North America. It's probably the original catalyst that led to the formation of the MSA. Apparently, prior to the MSA, our 49 American grand lodges could not come together to agree on creating such an organization. However, lodges during WWI were requesting to send care packages to Masonic troops overseas and the Federal Government refused to deal with all of them. And in 1918 the MSA was created for the purpose performing services which individual grand lodges can't readily do themselves. Since then, the MSA has taken on some other interests, such as some of the brochures you may see around your Tyler’s station, disaster relief, the Masonic Information Center (MIC), and short talk bulletins come to mind. 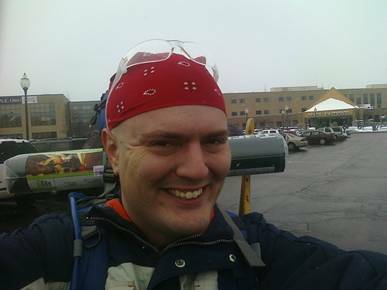 I am currently the Deputy Representative to the Masonic Service Association at the Wade Park VA Medical Center in Cleveland, Ohio. While some MSA HVP's maintain a more robust program of volunteerism, others keep it simple and stick to visiting the patients. The HVP attempts to address the morale and welfare of every serviceman and veteran within a facility, not just Masons. I've often found that the best opportunities in Masonry are the ones I invent myself. I'm going on a transcontinental hike (or at least I'm going to attempt such a feat) from the Great Northern Peninsula in Newfoundland on the Atlantic Ocean and ending at Cape Alva, Washington on the Pacific. To put it mildly, I've been blessed. I think I should mention that a similar route has been attempted before by Mr. Andrew Surka and is known as the "Sea-to-Sea" by the North Country Trail (NCT, which covers about 3,300 miles of the said 8,000 mile journey). Essentially, there are about 7 major trails in the northern USA which do not connect. And the NCT is considering the feasibility of the route as to whether they wish to finally establish those connections. It took him about a year to cross the continent. And from what I understand, during the missing links, the path in-between is at the hiker's discretion (which is the case in western ND and most of MT). It seems that he preferred a course which isolated him from civilization to test his ability to cope with it... not to mention that many hikers just like to "get away from it all." Not me. I'm not much of an environmentalist... I'm a distance person, myself. I project that my course will be different because my mission is different. And my mission is to travel domestic and abroad in support of the MSA-HVP in the United States. To put it mildly, the course, when at my discretion, will favor one thing... town. This transcontinental solo hike is what I call "Project: Wayfarer." Because of the nature of the MSA's 501(C)3, when I start fundraising, I will not be able to solicit donations from non-Masons (however, I can accept them). At the moment I am considering my fundraising options. What I can tell you is this... We will be doing things "electronically (i.e. PayPal or Google Checkout)." Brethren, on the trail we have what are called "trail angels." Which is if somewhere you see me on the road, don't be afraid to stop by, walk with me, give me a snickers, offer me some place warm to sleep, so on and so forth. I'm probably going to be requesting to sleep on Masonic building grounds anyways… even if it’s outside, under an emergency metal staircase. Before I conclude, I want to tell you a story. And this one is like another song, only this time by Hank Williams, Jr. (a.k.a. Bocephus) called "The Ride." It's when he gets picked up and the ghost of his father gives him (his career) a lift to Nashville. I was somewhere about 20 miles southeast of Canton, Ohio on the Buckeye Trail field testing a new piece of equipment (like a shakedown cruise). And my return loop put me on a secondary state highway. And I came up on a 3 way intersection and this Buick pulled up and the guy asked if I wanted a ride? And I've hitched before, only this was no ordinary hitch... and he certainly wasn't a ghost. But he was looking awwwwwwwwwfully dressed up for a rainy Saturday night. Turns out those decals on his tail lights were RAM... the suit he was wearing was red. And he even came complete with a KYCH tie clip. Apparently his blue lodge meets on 2nd Saturdays and he had just got out... and gave me a lift back to town where my car was parked. Now that you have read Brother Matthew's guest article, I would like to ask all of you to repost, link on your site, tell your friends, tell your lodge, post to Facebook or Twitter, and talk to your Grand Lodge about this plan. I feel very strongly about our brother's goal. If you are a brother in the northern states or southern provinces and would like to help out, please email him or "like" his Project: Wayfarer on Facebook. Thank you Brother Matthew for this article and good luck on your travels. Well readers, I have decided to get back into blogging after many months of nothing, which I’m sure has been a relief for all of you. During my tenure as Master, I was spending much of my free time, what little I had, on lodge duties. I loved the job of Master because I was able to dispense what little Masonic light I had on our newly admitted brothers. As I have stepped away from that role to my new role as Lodge Education Officer, I have been reexamining how I would like to present my Masonic ideas going forward. There was a time when Masonic blogs flourished. The internet was an open playground for ideas and brothers would present them with the hope of them catching on. Then Facebook came on the scene. All of a sudden, the great research disappeared, hidden behind an ivy covered gate, never to be explored or scrutinized by anyone but a small group with similar opinions. Facebook is the preeminent walled garden on the internet. Some of you might be asking yourself, what’s a walled garden? Well, in technology, especially in internet circles, a walled garden is a closed system designed to give a user a smaller set of information or applications \ to simplify the experience. In some cases, a walled garden can be a good thing. Web sites and the information on them are more varied than snowflakes. However, certain subjects are not necessarily aided by a closed system, especially if they are already a niche to begin with. I believe that Masonry is one of those niches. There are many message boards online for Masonic subjects and most are closed. Now, any brother who delves into internet Masonry knows that if you’ve never actually sat in lodge with a brother, you should not be discussing Masonic secrets online, in any forum. 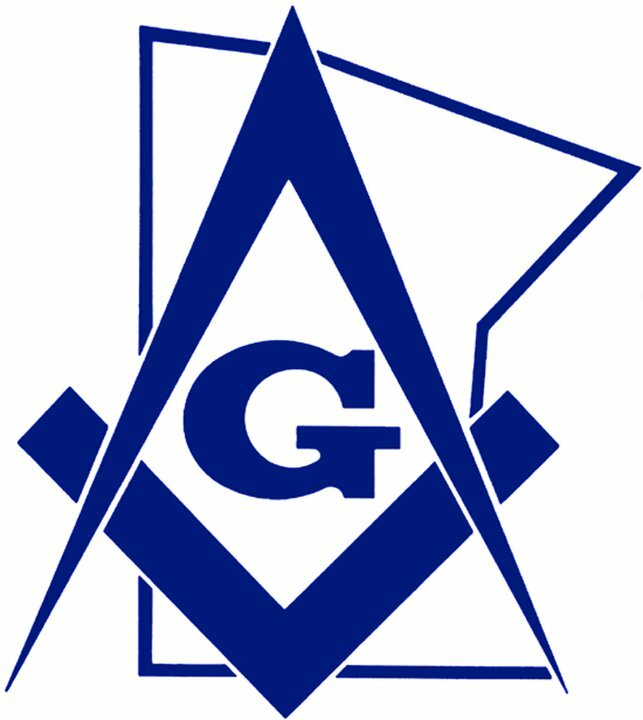 In Minnesota, our Manual defines what a Masonic secret is and it is fairly easy to decide what can and cannot be discussed online. I have been wondering why message boards for Masonic subjects are often closed considering that secrets are not to be divulged without due examination of the brother. My only conclusion is to create a walled garden. Our ideas are our own and should not be filtered except in accordance with our own Grand Lodge’s policies or for general editing. There are many issues and best practices that need to be addressed in Masonry. Research into Masonry should be open in so far as is allowable based on our obligations. That is why I am going to avoid closed message boards for awhile. I want to focus on what a lodge needs to grow, the history of our Fraternity, why a young man petitions, and the interesting world of Masonic jurisprudence. I can only accomplish this if I open my research to you to comment, unfiltered and unabridged. So my readers, I hope to give you my broad perspective on the myriad subjects that strike my fancy. I hope you will join me on my quest for further light in Masonry, outside the wall.